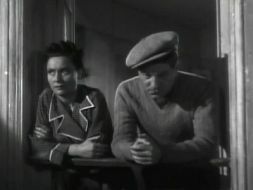 Marcel Carne’s La Jour Se Lève (Daybreak) sees French star Jean Gabin used to great effect in a heartbreaking story of romantic obsession and disillusionment. A key example of poetic realism, the French genre that served as a precursor to film noir (indeed, this movie was remade in America, as 1947’s Henry Fonda vehicle The Long Night), its combines location shooting with vivid stylization. It finds equal atmosphere in its shadowy exteriors, its ominous musical score, and its suffocating factories. Set convincingly on the streets and in the tenements, every frame here feels lived in. The script, from Jacques Prévert, opens as Gabin guns a man down, but turns out to more sensitively drawn than such an ostentatious opening would suggest. As the film proceeds, it contrives a tragedy suitable for a common man. Gabin plays Francois, an orphan who has learned not to expect terribly much from life. Quite to his own surprise, he finds himself smitten with Francoise (Jacqueline Laurent), a flower girl and fellow orphan. Before long, however, the cast of two expands to a cast of four, and the two lovebirds become romantically entangled with Valentin, a manipulative showman (Jules Berry), and his worldly assistant, Clara (Arletty). Carne keeps his cast small, and the mood intimate, enhancing our awareness of his characters’ discontent. Fittingly, it’s not any sort of grand hubris that leads to Francois’ downfall, but cruel fate coupled with a world that is all too willing to exploit him. Everything in La Jour Se Lève reinforces the feeling that things will end badly for poor Francois. The structure, which utilizes flashbacks as Francois, holed up in his apartment, waits for the police to inevitably break down his door and take him to his death, casts an existential pallor over all that follows. His sad fate is clear from the outset. All he can do, it seems, is to wait for it to be realized. Even as the flashbacks play out, however, signifiers of what is to come are provided. Throughout the film, Francois coughs loudly, blaming the toxic fumes at his job, and inspiring many to comment on his poor health. Worse still, Francois’ relationship with Clara seems doomed from the outset. It’s made clear that she is a substitute for Francoise, even though she understands Francois’ needs. Whenever specters of hope and happiness rear their heads, it’s made obvious that they are only setting Francois up for further disappointment. Other visual symbolism suggests the worst. Beyond the claustrophobic feel of the film, and the expressive use of shadows, Carne works to remind us that Francois cannot escape the scene that opened the film. Francoise’s childhood trinket, a one-earned teddy bear is emblematic of her, and the entire cast. These are damaged people, who go on living despite their scars and setbacks. Francois’ apartment building stands alone, towering above the other buildings of his village, pitting him against the world. From it, he assaults the people gathered to see the spectacle of his downfall, mocking his job and disavowing his existence. The way that the flashback structure is employed only adds further to the sensation of the inevitable. As Francois looks at the crowd amassed on the street, or the wardrobe that he’s using as a makeshift barricade, the shots dissolve across time but not space, reminding him of how things used to be… of how his everyday existence became a living nightmare. Similarly, but even more poignantly, when Francoise finally breaks off his relationship with Clara, the scene ends as she seems to evaporate before our eyes, leaving a void of gray on the screen. La Jour Se Lève aches with disappointment and makes the possibility of love to transcend life’s disappointments seem remote. When speaking with Clara, Francois scoffs at the notion of romance, saying, “Love life indeed! That’s alright in books, for chaps with nothing to do, but I slave away all day… I need my sleep at night.” Reality intrudes incessantly here, crushing hopes of a happy ending. Jean Gabin’s resigned romanticism might have never been better utilized than in this movie. At once, he embodies a dare to hope and its ironic counterpoint. He’s bruised but visibly aching throughout the movie. Incapable of crying, even when the authorities break out the tear gas in La Jour Se Lève’s finale, he serves, like the film, as a counterpoint to romantics everywhere.